Smart locks, like any connected device, ideally work easily in your smart home. That's not always the case — and often you find your new gadget doesn't play nice, or speak, with other products, and platforms, you have running. But we think of the August Smart Lock Pro as one of the friendliest — working with three different wireless protocols including Wi-Fi, Bluetooth and Z-Wave plus Amazon Echo, Google Home and Apple's upcoming HomePod. Before buying a smart lock, you should always ask yourself a few questions: Does the manufacturer have experience making smart locks? Can I easily install this lock on my own, or will I need to get someone to do it for me? And finally, will the product work with any wireless networks I need? August Home hits a home run with all three. Unboxing of August Smart Lock Pro. 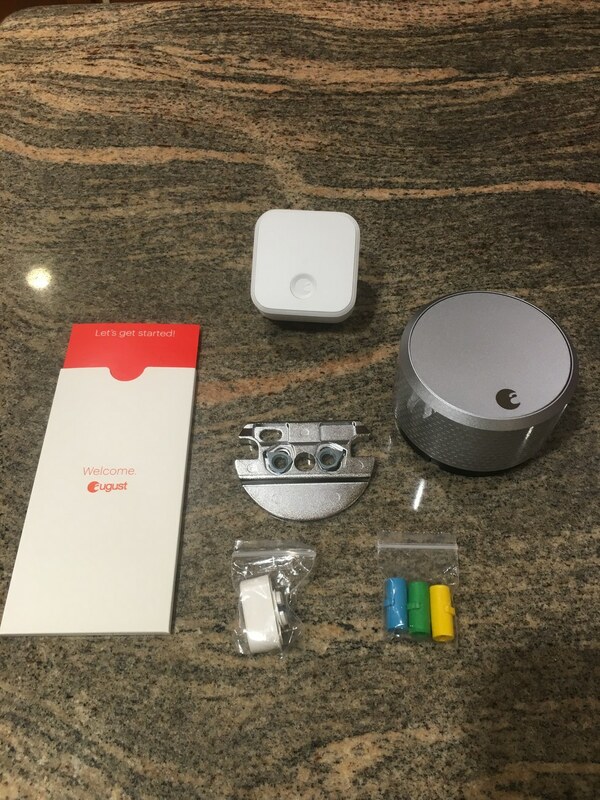 This is August Home's first smart lock bundle, and inside the packaging is the August Smart Lock Pro, August Connect Wi-Fi Bridge, a DoorSense sensor, four AA batteries, a lock adapter and mounting hardware. Like the previous August smart locks, this third-generation smart lock is easy to install. But do make sure the door you're using has a single-cylinder deadbolt. Like previous generations of August Smart Locks, the lock covers just the back-half of your door: you don't replace the entire lock. This means you have a backup plan in case the smart lock malfunctions. By replacing just the back-half of your deadbolt lock, you can still use a key to get in the door. August Home mobile app updated. The August Home mobile app is updated, with new graphics and instructions — which simplified installation, and were easy to follow. Currently own an August Smart Lock? You won't need to download a new mobile app for this product. Just open the August Home app on your smartphone and select "Set up a New Device." Then select "August Smart Lock Pro (3rd Generation) and begin the installation process. The big boost for the August Smart Lock Pro is how many more ways you can speak to the lock. While many smart locks are usually compatible with one wireless protocol, August Smart Lock Pro is the first we've found to work with three different wireless protocols: Bluetooth, Wi-Fi and Z-Wave. With the industry, as yet, not settling on a standard wireless protocol, knowing your smart lock works will all three gives you several options. If you have devices working with Apple HomeKit, Insteon or the Wink smart hub, the August Smart Lock Pro can be integrated and controlled by these. That flexibility is key today. August Home integrates August Smart Lock control with Amazon Alexa. August Smart Lock Pro also works with all three-voice controlled smart speakers: Google Home, Amazon Echo (Alexa) and Apple's upcoming HomePod (Siri). August Home says its the first smart lock manufacturer to accomplish these integrations. If you currently own an August Smart Lock and Amazon Echo, you don't need to get a new Alexa skill. 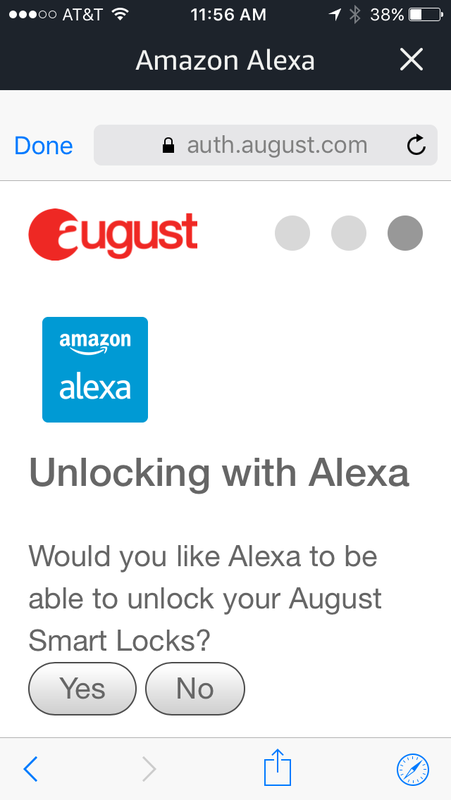 But you will need to re-register your new August Smart Lock with Alexa. We were able to easily add the new lock — but give your new lock a new name, even if you're replacing the lock. If not, Alexa could get confused, making it complicated to control your August Smart Lock Pro via Alexa. 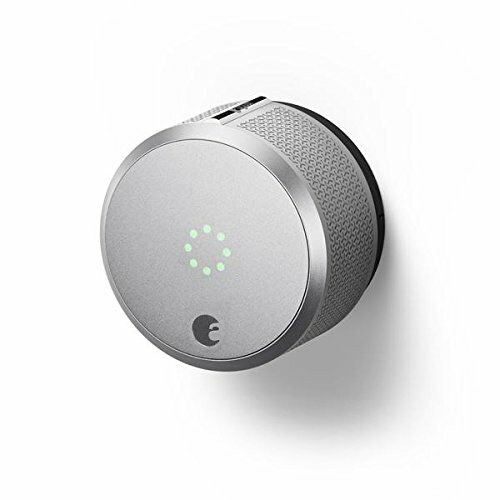 August Smart Lock Pro consists of not just the lock but the August Connect Wi-Fi Bridge and the company's new DoorSense sensor. 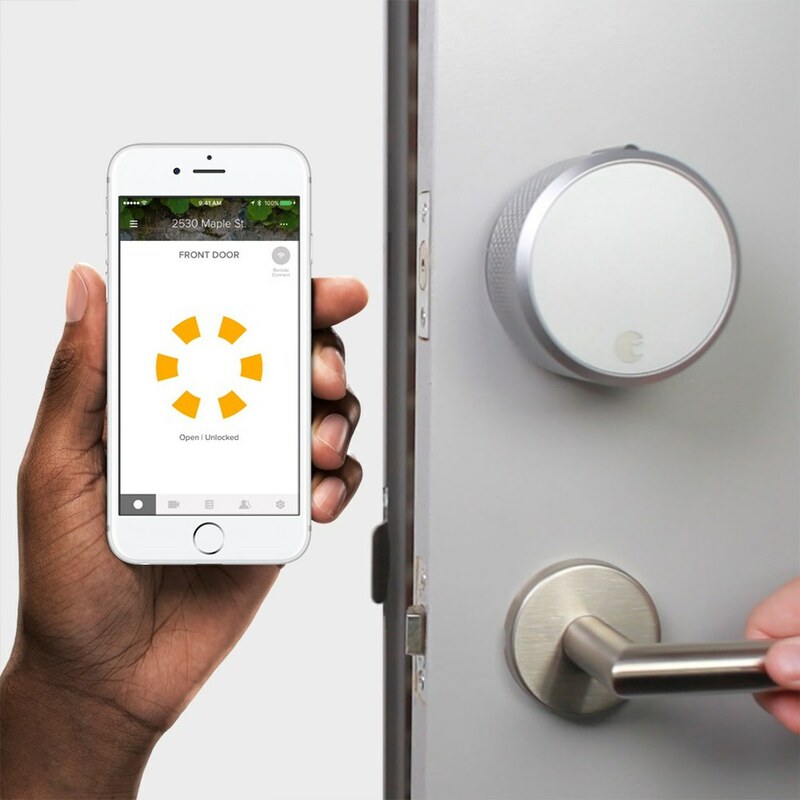 To remotely access the smart lock, connect the device to the internet via a wireless signal. While most smart locks connect via Bluetooth you need to be within 10 to 15 feet of your lock or right outside your door. Smart lock manufacturers also let you connect through the internet — but you need a bridge or network adapter, an extra device which you have to buy. 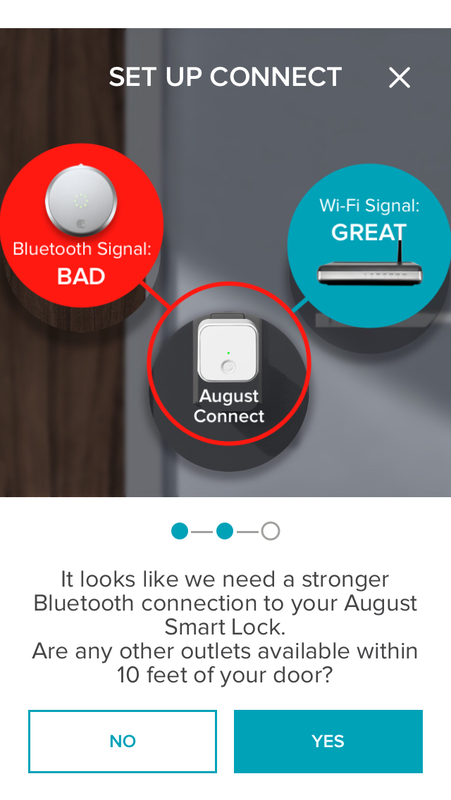 The August Connect Wi-Fi Bridge solves all of these issues — and is included in the bundle. August Connect completes the connection between our August Smart Lock and home router. With the bundle, we also tried August Home's new DoorSense technology and Active Monitoring, a beta of smarter alerts, for the first time. The features lets home owners know when their door is open or closed, and also control auto lock tools. You get an alert if your door is unlocked or left slightly ajar — and you can schedule when your door should lock (i.e. once you close it, the door automatically locks.) You can also set notifications so you know when people enter your home — like kids coming in after school. These are solid security features for a smart lock, especially one integrated into a home security system. Need to determine the best type of mount for your door first. 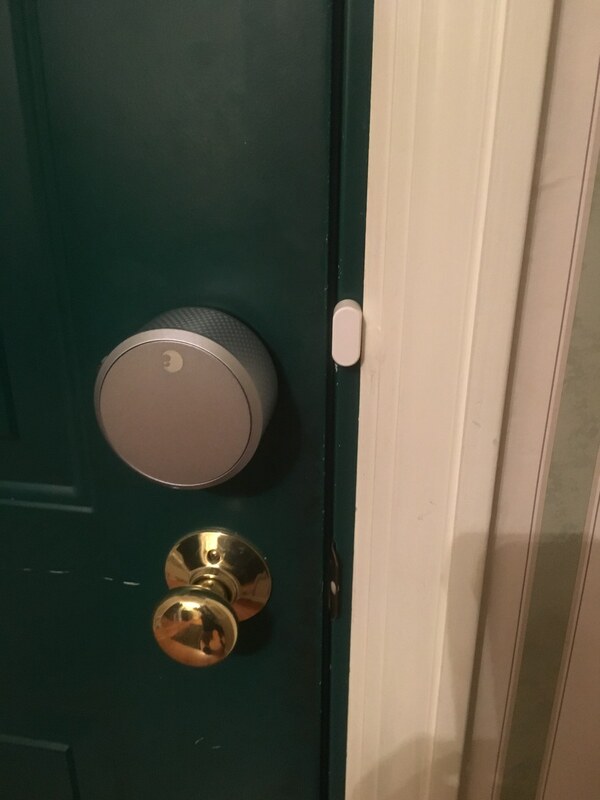 We tested surface mount for the DoorSense sensor. You will need to follow the steps in the mobile app to calibrate your door sensor. it should take a few minutes to complete. After the last step, your door will be successfully calibrated and ready for use. 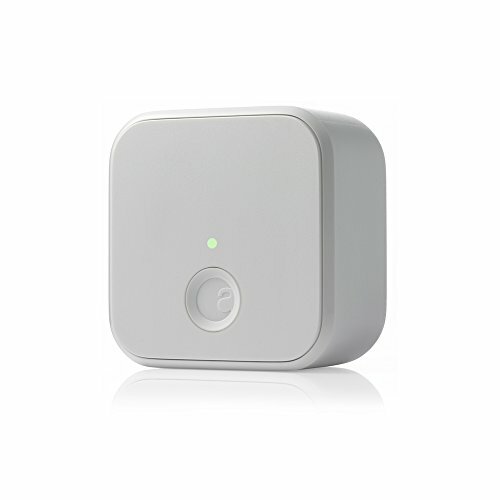 To install the August DoorSense sensor, place it on your door frame, next to the August Smart Lock. If you don't want the door sensor to be visible, August does let you place the sensor flush on your door frame. You'll need a drill to create a hole in the frame to insert the sensor flush up against the frame. Once it's in place, use the August Home app to set up the sensor for when you want alerts. The mobile app can walk you through both options — and we recommend you follow the app interactive instructions closely to assure you set the sensor up correctly. Z-Wave is a popular radio frequency (RF) protocol used by many smart home devices, operating at a lower frequency than typical wireless networks to avoid interference and effectively move through walls, and is used in devices from companies like Samsung and Nexia Home. 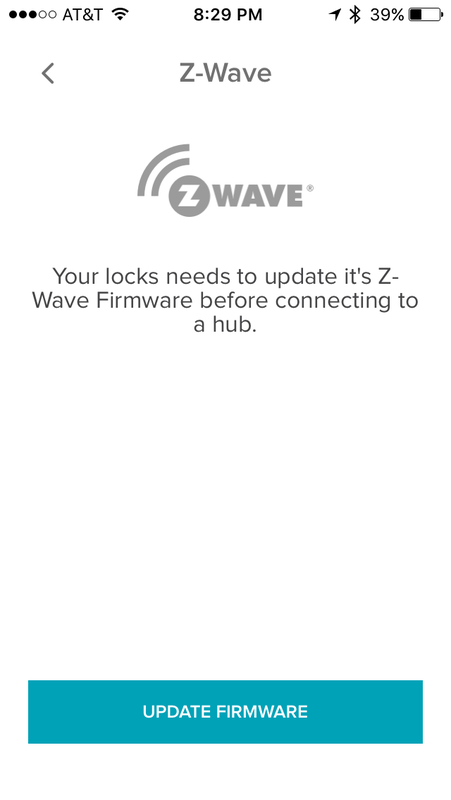 Might have to update your Z-Wave firmware before connecting your August Smart Lock. We connected the August Smart Lock to a Nexia Bridge, a Z-Wave connected hub, which required we tap into both the Nexia Home and August Home app. Check your Z-Wave device to make sure you've downloaded the most updated firmware since August Home just recently launched its Z-Wave integrations. Our setup of the August Smart Lock with Nexia took longer than we would have liked — but we were eventually able to connect. Our Apple HomeKit connection was much easier to complete, but we did that over Wi-Fi. Once we connected to the Nexia Bridge, though, controlling the August Smart Lock Pro via the Nexia Home app was simple. We could even use voice control in the Nexia app to lock and unlock our August Smart Lock — which was nice. If you own a Nexia Bridge, and want to add a smart lock to your system, consider the August Smart Lock Pro. August Smart Lock Pro (bundled with August Connect Wi-Fi Bridge) retails for $279. If you want just the new 3rd Generation August Smart Lock, this smart lock is priced at $149 and available in silver and dark gray. August products are available from retailers including Amazon, Best Buy and August's web site. August Smart Lock Pro is a very good smart lock bundle especially for those starting to build a smart home. 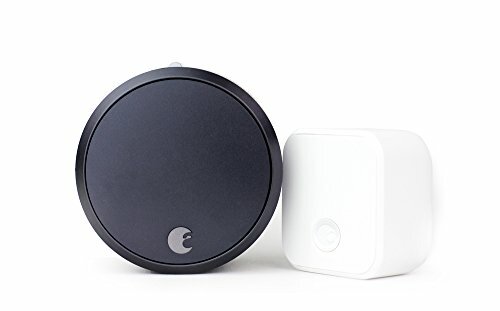 Since the lock works on three different wireless connections, you have more options to choose from as you add more connected products in your space. Overall, the price of this smart lock bundle is a little high but we think it's worth the investment. Not many smart locks offer you easy installation, remote access, wide range of compatibility, voice integrations with all three smart speaker systems and peace of mind in knowing who is coming or going — plus alerting you when your door is left open. Pros: Remote access, door sensor technology, third party integrations with alarm companies, Z-Wave compatible, Wi-Fi & Bluetooth compatibility, easy to install, and speaks to all three-voice controlled smart speakers. Cons: design of the lock and bulky.